Kung hee fat choy! 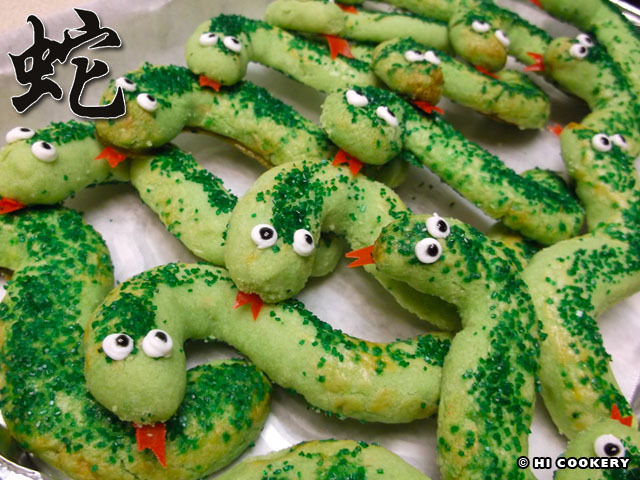 We rang in the Year of the Snake on this Asian lunar year (2013) with some slithery and slightly sweet sugar “snake cookies,” a combination of our Chinese almond cookie and freaky finger cookie recipes. Although these are not traditional treats, the cookies are cute and easy to make for a fun and festive new year (or Halloween) celebration. Cream the shortening with the sugar until smooth. Stir in the almond extract. Mix in the flour until the dough sticks together. Fold in the almonds, if using, and blend well. Tint with green food coloring. Shape into a ball. Cover with plastic wrap and refrigerate for at least an hour. 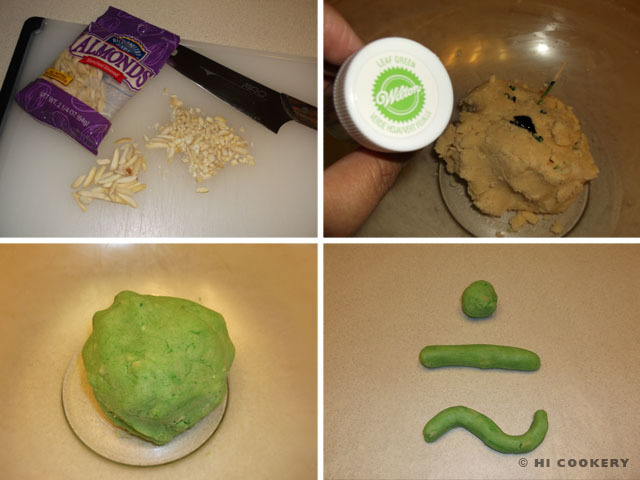 Remove the dough from the refrigerator and pinch out 1 ½ inch balls. Gently roll out into 5-inch long ropes. Curve into a slight S-shape, smoothing out the cracks. Place on a slightly greased baking sheet about 1 inch apart. Continue making the rest of the “snakes”. Brush the tops of the snake with beaten egg. Sprinkle with green sugar. Refrigerate for another 30 minutes. Bake in a preheated oven at 350 degrees F for 20 minutes but do not brown. Remove from the oven and let the cookies rest on the baking sheet for 15 minutes. Transfer the cookies to a wire rack to cool completely and crisp up. 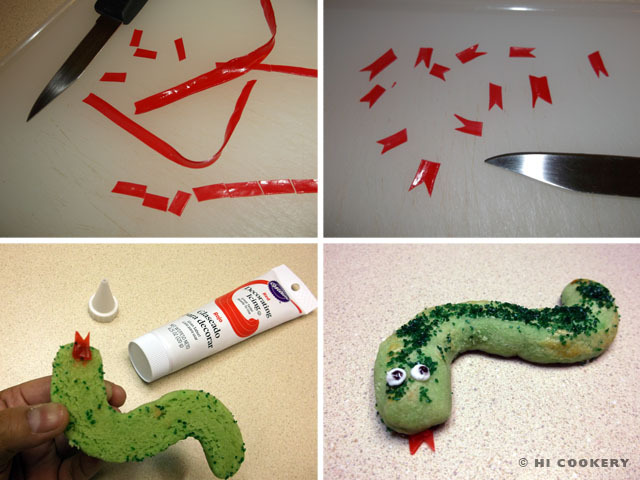 Use a small round tip to pipe white eyeballs on one end of the snake cookies. Dab a little black tube gel on the white eyeballs to make the pupils. Unroll a strawberry fruit roll up. Slice into thin strips, then into tiny rectangular pieces. Cut slits on one end to make a forked tongue. 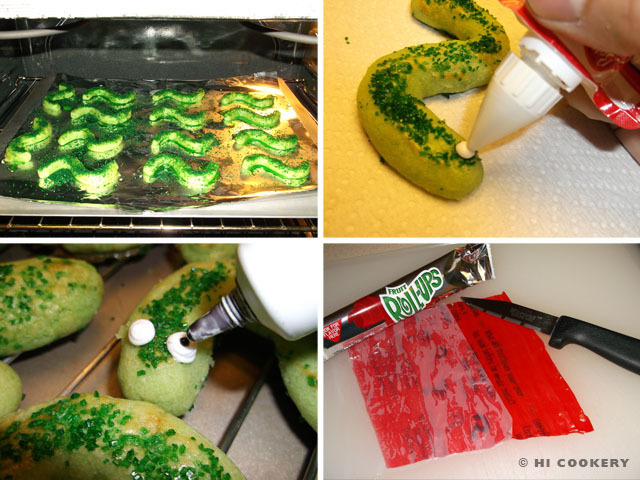 With a little red frosting, position the red fruit roll up tongues underneath one end of the snake cookies. Continue for the rest of the cookies. Place on a platter and serve or store in an airtight container up to a week. 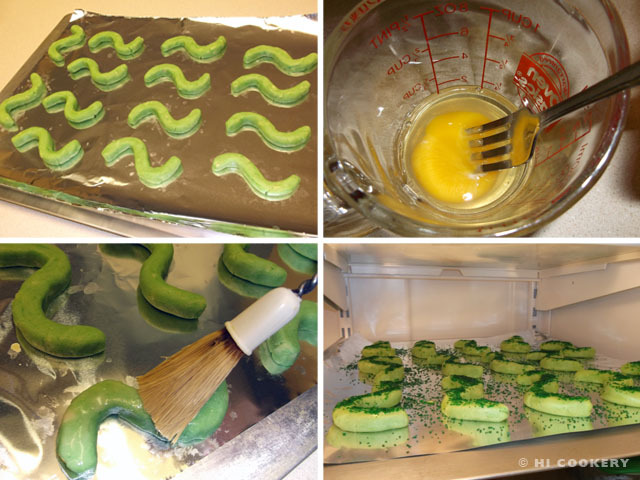 Yield: Approximately 15 snake cookies. 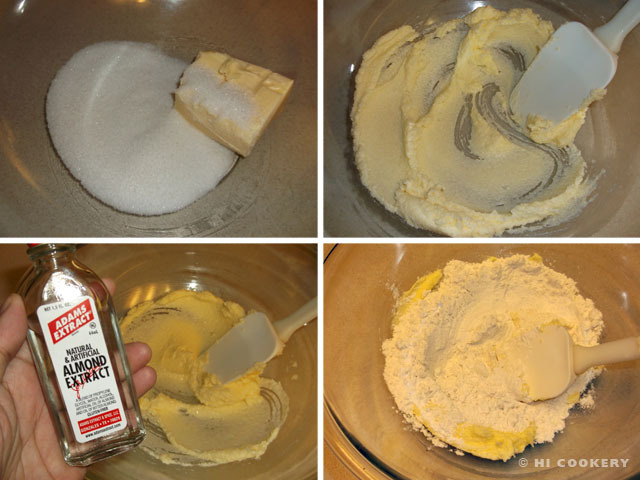 Gel food paste yields a more vibrant color on the cookies than liquid drops. Minimize the frosted points of the piped white eyeballs by touching your fingertip with a little powdered sugar, then pressing down lightly to flatten before adding the black gel pupils.